The paucity of materials on Antioch in the ancient literature means that each mention much be cherished. One of the pieces that we know of and that is now lost is the Monody for Antioch (Monodia per Antiochia/μονωδια Αντιοχαιαζ)by Procopius. This work appears to have still existed into the 12th century when it was used as a reference source for some homilies written and delivered by a Sicilian monk, Philagathus Cerami (otherwise known as Filogato Cerameo). The most extensive reference to this lost work is made in an article by Professor Aldo Corcella in, «Echi del romanzo e di Procopio di Gaza in Filagato Cerameo», Byzantinisches Zeitschrift 103, 2010, pp. 25-38..
Procopius (c. 465-528 AD) came from Gaza, a city now better known for its political football status, but back in the fifth century had somewhat of a literary fame. The Monody (in form most usually a poem in which one person laments another's death) he wrote was in relation to the devastating earthquake of AD 526 that flattened Antioch. Allusions to the Monody in Philagathus's Homily No. XII (in the Patrologia Graeca numbering): "In Sanctos Innocentes dicta in ambone archiepiscopalis ecclesiae" on the theme would appear to be a vestige of this elusive work by Procopius of Gaza. Rumours that a "Hilton" was being built on the site of the Forum of Valens have swirled for a couple of years now. The brand name may be wrong but the latest discovery on the site would seems to suggest that we are talking of a site that could very well be the long-lost forum that was redesigned by the Emperor Valens. The area had structures built by the Romans as far back as Julius Caesar, while others such as Tiberius and Commodus has added to the mix. 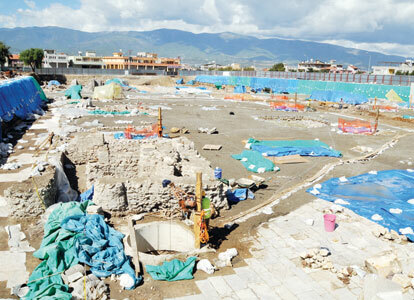 The site photo in the article shows the massive area uncovered. Our thoughts are that 3,000 sq metres of marble paving is not even one of the famed marble streets but quite clearly a very large open space. Morover the 850 sq metre mosaic uncovered is clearly not a domestic structure to have a room of such dimensions and could very well be one of the many basilicas the surrounded the forum, or the Library (the Museion) or some other significant structure. This is an enormous shame that this will be buried in a "museum" in the hotel's basement. There should be no building at all in the still lightly covered northern section of the old walled city. While the mayor of Antakya gets all excited about tourists he should maybe look to Ephesus to see what his real potential could be rather than building over the sites. This hotel should go somewhere else. We have written before on the Omphalos, a sort of central point of the city, effectively the navel of Antioch. This is a concept which also existed in sculptural structures in Rome, Athens and Constantinople as well. "Non mi par certo che lo Omphalos di alcuna città greca fosse un monumento particolare, come si suppone l'Umbilico di Roma. Si dice che in Costantinopoli il monte centrale si chiamasse con quel nome . (Veggasi Ducange, Gloss. med. et inf. Graec. s. v. ομφαλοζ, μεσομφαλιον.) Lo omphalos di Antiochia si descrive dallo storico bizantino Malalas, come un luogo nel mezzo dei portici che traversavano la città, dove stava, sopra una gran colonna di granito, un monumento eretto in onore dell'imperatore Tiberio, nel quale luogo vi era un'immaggine di un occhio incisa in pietra. Ανεστησε τω αυτω Τιβηριφ χαισαρι η βουλη χαι δ δομοζ των Αντιοχεων στηλην χαλχδν υπερανω χιογοζ θηβαιου ζο τη πλατεια χατα το ρισον των ομβολων των υπ αυτον χτισθιντωπ θστιζ τοποζ χεχληται ο δμφαλαζ τηζ εχων χαι τυπον εγγεγλμμινον εν λιθω οφθαλμου ητιζ στηλη ιοταται εωζ τηζ νυν. Malalas, Clirou. lib. x. (ed. Dind. 233). Il Mueller, il quale per οφθαλμου ha voluto leggere ομφαλον, opinò che si trattasse d'un monumento simile a quello delphico. (K. O. Mueller, Antiq. Antioch.57). Ma anche con questa lezione, le parole paiono accennare piuttosto ad un'immagine di quel simbolo intagliata, forse nella base del monumento di cui parla l'autore". This famous structure on the Island sector of the city has long intrigued us and we have previously commented upon it. We took its name as being probably because it had a quadriga of elephants drawing a chariot (as sometimes appears on Roman and Seleucid coins) atop the structure. However, we stumbled upon a reference to the Victory of the Elephants in 273 BC and this started us wondering if the structure maybe had its origins in this event very early on in Seleucid history and thus was some sort of triumphal monument (not an uncommon purpose in an Arch or its more complex manifestation, the Tetrapylon). The sequence of events that led to this victory (and maybe its commemoration was that in 280 BC, after personally assassinating Seleucus I and murdering his two young rival claimants to the throne, Ptolemy Ceraunos managed to seize the kingdom of Lysimachos (who had died the previous year, leaving no heirs strong enough to hold their father's throne). However this unscrupulous adventurer had little time to enjoy his successes. The following year he met a large army of migrating Celts. As a result of this battle, Ptolemy Ceraunos' head was forcibly removed and used to decorate a pike. 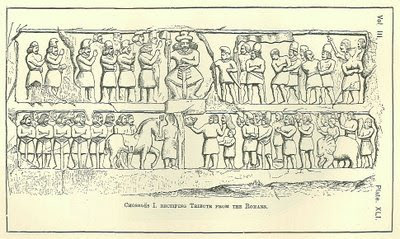 These Celts were to become known to the Greeks as the Galatians. These Eastern Celtic people seemed to have fought much like their better known Gallic counterparts who later invaded Italy and sacked Rome. Except for their chieftains, these warriors were poorly armed and trained. However their terrifying, impetuous ferocity made them irresistible in battle, as Ptolemy discovered to his detriment. The Galatians quickly scattered to plunder Macedonia, Thrace and Greece. The Greeks avoided any pitched battles with these barbarians from the north, and although the Galatian looting met with some initial success, eventually the Greek harassment drove the invaders out of Greece and Macedonia. Retreating to Thrace, the Celts were invited to intervene in a Bithynian civil war that was raging. Around 20,000 Galatians crossed the Bosporus where they quickly settled the Bithynian question of succession. Naturally, having completed their task, the Galatians were not about to leave. They enthusiastically set about pillaging Asia Minor. Unlike Greece, the inhabitants of Asia Minor did not resist the Celtic invaders. To avoid destruction, they paid the Galatians protection money. The Galatians thus settled down in the centre of Asia Minor to continue their profitable blackmail. About six years later, in 273 BC, the king of the Seleucid Empire, Antiochios I, decided to deal with the Galatian interlopers. According to the (somewhat sparse) sources, the Galatians had about 20,000 cavalry alone, heavily outnumbering Antiochios. Since the Celts had crossed into Asia with only 20,000 men in total a few years ago, this number is obviously greatly inflated. Still, even if Antiochios wasn't outnumbered, most of his army consisted of light troops. The Galatians, and everyone else, were also highly convinced of the Celts' invincible fighting prowess. So the morale in Antiochios' army was probably rather poor at the outset of the battle. The Galatians began the battle by opening their ranks of warband to let their scythed chariots pass through the infantry. However, Antiochios had taken the advice of a tactician Theodotos of Rhodes, and managed to conceal his elephants from the Celts. The chariots were bearing down on the Seleucid ranks, when the elephants suddenly appeared. Eight elephants faced the chariots in the centre; an additional four faced the Galatian cavalry on each flank. The terrified Galatian horses, unused to the sight of these behemoths, bolted and dragged the deadly scythed chariots back through the warbands in great bloody swathes. The elephants followed up their success and trampled into the Celtic ranks, completing the rout. Antiochios I had defeated the feared Galatians. Thus there is good reason we believe to think that the tetrapylon may have had its origin in this victory. This document is long lost but referred to in some of the ancient texts, particularly John Malalas. "......ebbe per le mani e fece uso degli Acta urbis Antiochiae, simili agli Acta diurna populi romani, dove trovavansi registrate, in uno agli editti, agli atti concernenti gli edifici, alle opere pubbliche, agli incendi e tremuoti, le memorie ancora più importanti della città e quant'altro allo stato della medesima appartenesse. Tali Acta sono espressamente citati dal Malala là dove parla della denominazione di Θεουπολιζ; data sotto Giustiniano ad Antiochia per acclamazione popolare. Nò il Muller credette ostare a che tali atti assorgessero al tempi dei Seleucidi. Da queste premesse, è tacile inferire che l'autorità del Malala rispetto alle coso antiochene conviene apprezzarla dal valore delle fonti a cui egli attinse: e tosto vedremo come il martirologio siriaco sopra citato renda alla veracità e precisione del Cronografo antiocheno nuova e splendida testimonianza". "adhibitis paucis clam ferro succinctis vesperi per tabernas palabatur et compita, quaeritando Greco sermone,cujus erat impendio gnarus, quid de Caesare quisque sentiret. Et haec confidenter agebat in urbe, ubi pernoctantium luminum claritudo dierum solet imitari fulgorem". 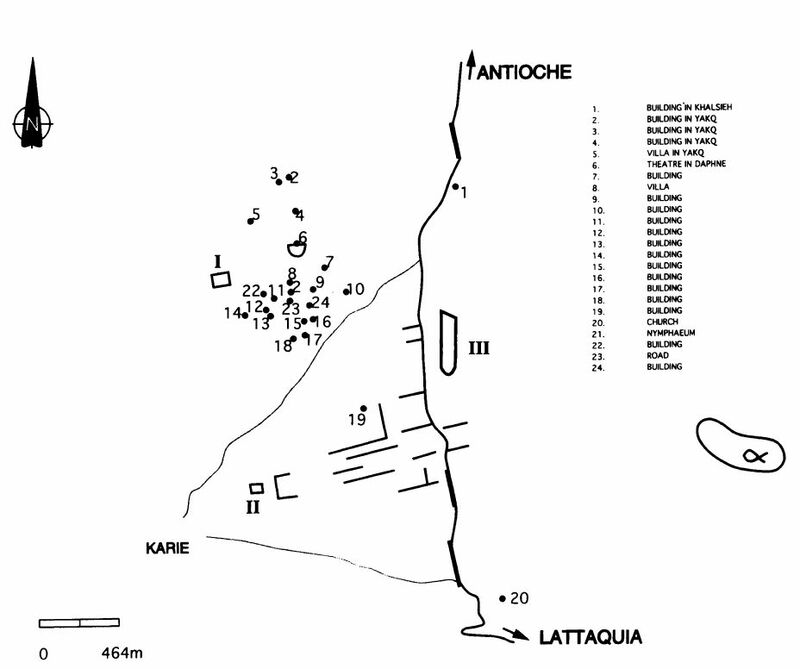 The lighting of the streets in Antiochia in the fourth century, had already been placed beyond a doubt by the passages of Libanius". "267. Here he is not "lord of men," neither does he draw men to himself against their will, or lull them to rest by force, but we alone of all people have shaken off his tyranny over our eyelids, and to the torch of the sun there succeeded other torches which surpass the festival of the lamps in Egypt, and among us night differs from day only in the kind of the light. Night is the same as day for the handicrafts, and some work vigorously while others laugh gently and give themselves up to song. The night is shared indeed by Hephaestus and Aphrodite, for some work at the forge and others dance; but in other cities Endymion is more honored". The main takeaway from this is that Antioch was quite superior in this aspect of its civic amenities than was the capital of the Roman Empire.